“The money is easy to make and it’s definitely nice to spend,” Jeremy Carroll of Blountville, Tennessee, recently said. The southern native explained, “You just have to have the drive and determination to work really hard for it!” It was this philosophy that led Jeremy to name his Beloved K5 Easy Money. The name serves as a bit of a tongue-in-cheek retort to those who find the need to question Jeremy’s success, because it really doesn’t come easy despite his boasts to contrary. 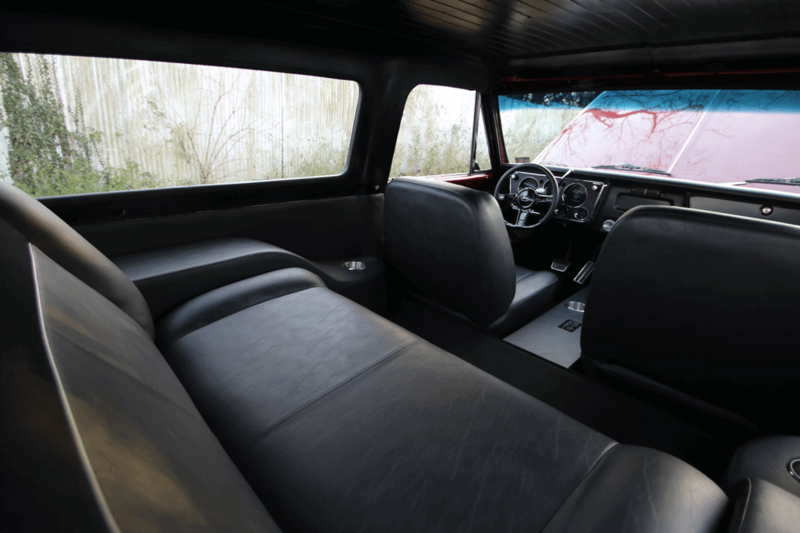 His ’71 K5 Blazer is certainly an elaborate build, one on which no expense was spared, but every penny was worth the final result. And every drop of sweat that went into earning those pennies is what makes it all worth it. 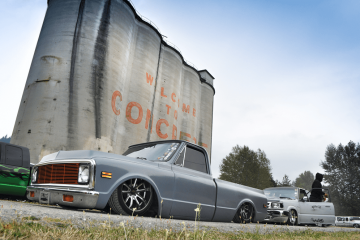 Jeremy’s obsession with custom trucks dates back to his youth, helping out his grandfather in a parts shop. 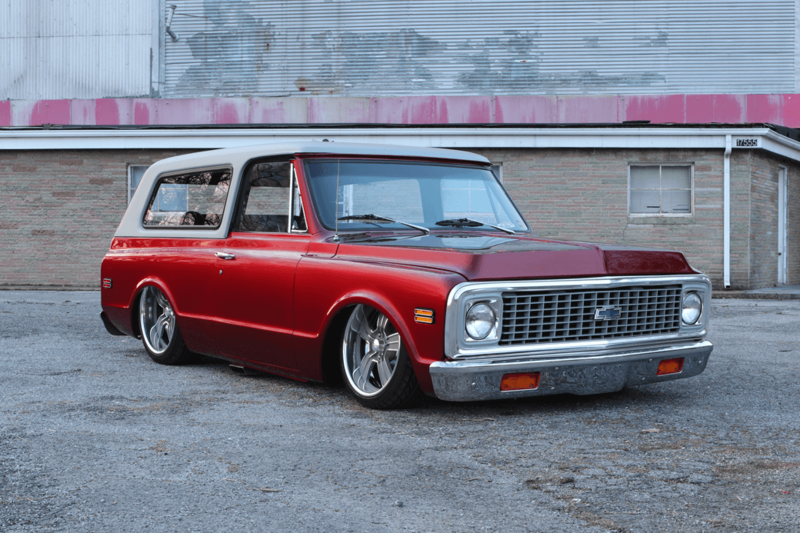 In 1999, Jeremy’s passion found a home in the mini-truck scene, and he has since built on that passion with a ton of different custom builds, including a Nissan Hardbody, Chevy Astro van, multiple C-10s, a GMC dually, a Brookwood wagon and another K5, to name only a few. The rumble of the Chevy V-8 is spiced up with badass sheet metal work and Billet Spe-cialties accents galore. 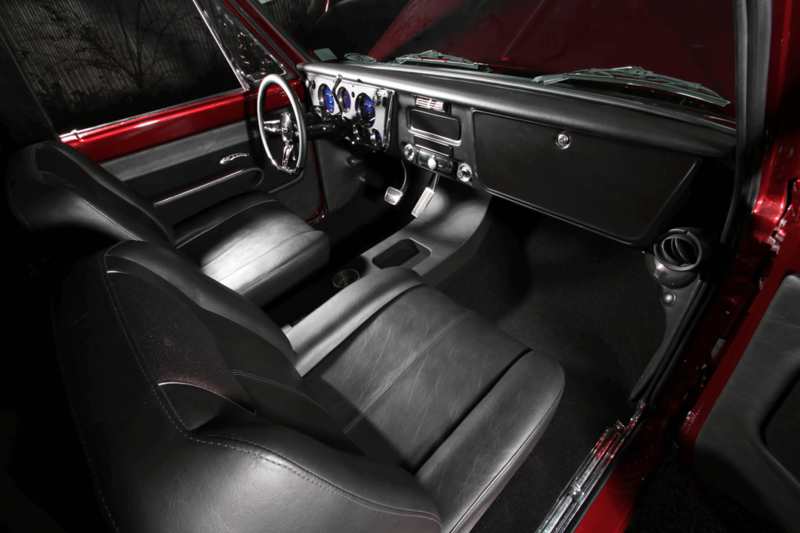 A few key modern interior upgrades include the Dakota Digital gauges and Billet Special-ties half-wrap wheel. 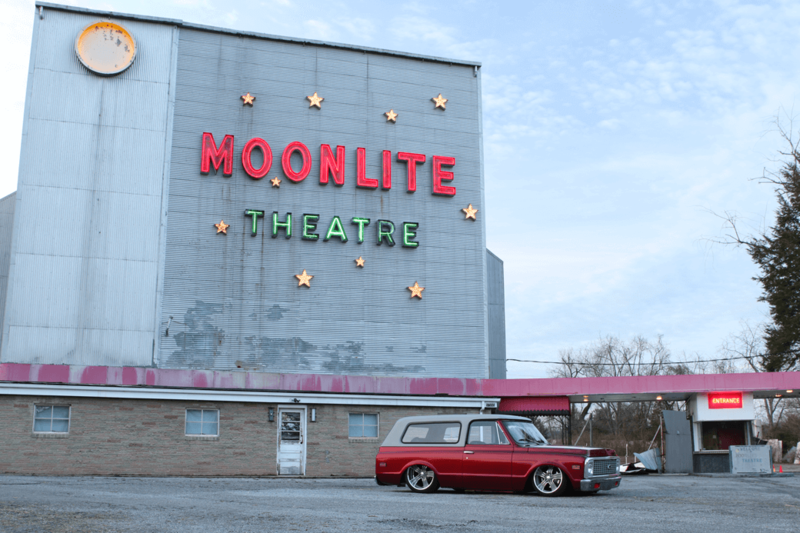 Jeremy first purchased his most recent project in 2012 from Boris at Street Machinery in Cleveland. 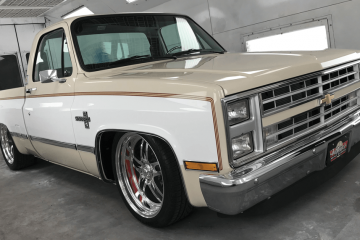 The truck had already undergone a frame-off restoration and was slammed on airbag suspension. 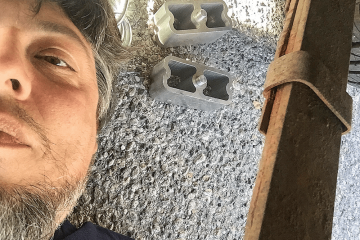 Jeremy intended to have a comfortable K5 cruiser, but when he saw the level to which the K5 had been completed, he decided to finish the truck step-by-step. The end result is a first-class Blazer built to take the show circuit by storm. The ’71 is a customized masterpiece from the top down (literally). 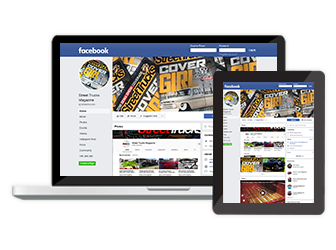 Beneath its impressive body panels and stunning paint job lays a solid foundation. 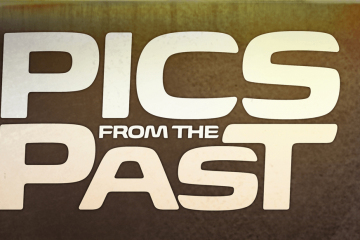 Because it was a frame-off restoration, the chassis and suspension were fully addressed by D&S automotive in Mentor, Ohio. The team began by revamping the frame with a custom-fabricated C-notch to accommodate the slammed stance. The rearend of the chassis was converted to a triangulated 4-link configuration from Thor Bros. The 4-link uses a ’bag-on-bar setup for the air ride suspension, and AccuAir’s E-Level system monitors the air management. Working in beautiful harmony with the extreme suspension is an equally aggressive wheel and tire setup. 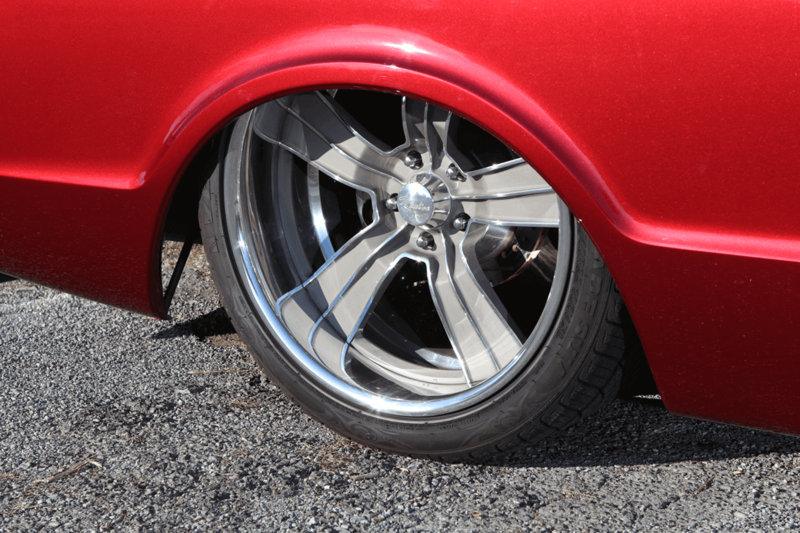 Easy Money sports a staggered set of 20×8.5 and 22×10-inch Racelines. The Hooligans are finished in two-tone Meteor Gray and full polish. The wheels are wrapped in Nitto low-profiles measuring 245/35/20 and 265/40/22, respectively. Tucked elegantly behind the Racelines are massive brakes from CPP. The big brake kit deploys four-piston calipers in the front, two-piston in the back and 13-inch rotors. In addition to the monster stoppers, the brake system is fortified with hard lines and a billet master cylinder. Pro Stitch handled the triple black interior duties with the right amount of polished accents appropriately placed throughout. 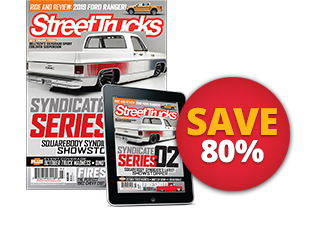 Motivating the brakes is a classic hot-rod-style Chevy small-block. The 350 V-8 sports several modifications, both of a performance and aesthetic nature. A bit of muscle car soul is channeled through the motor thanks to an upgraded camshaft from COMP Cams. The engine has also been properly ported and polished. The motor breathes through a custom air cleaner and Edelbrock 650 series carburetor. The exhaust flows through shorty headers on to a custom 2.5-inch stainless system and ends in dual Flowmaster mufflers. The motor is beautified by way of a Billet Specialties front cover, valve covers, water pump, pulley kit and chrome alternator. All the power is sent through a Chevy turbo 350 trans to a limited slip differential equipped with 3:55 gears. Sitting atop the custom chassis and suspension is a collection of world-class bodywork. D&S Automotive began by shaving the gas filler, as well as supplying a custom lid. Then the crew smoothed and rounded all of the door edges and jambs. The inner fenders are all custom fabricated steel. Pro Stitch in Maryville, Tennessee, put together a killer engine bay. Under the hood rests custom steel inner fenders and radiator cover. 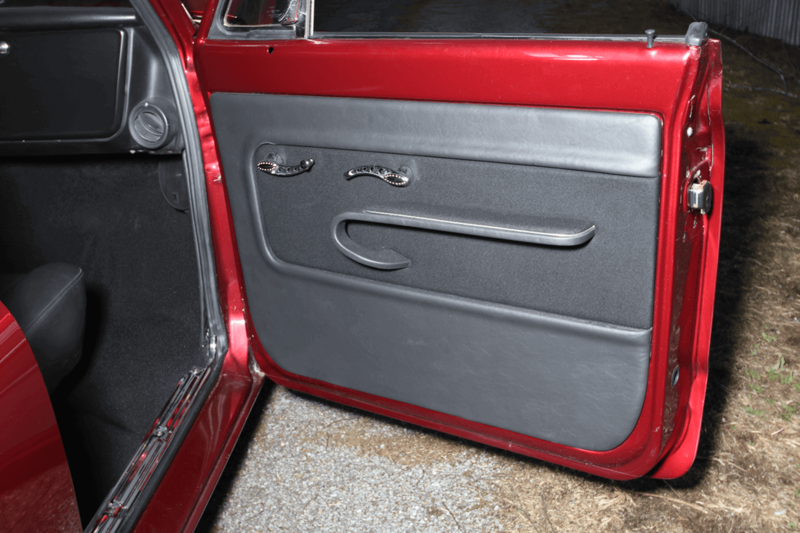 The crown jewel of the bodywork is a one-off steel rear hatch in place of the OEM fiberglass. The hard top was handmade by James Tiffany from Driveway Werks. After completing the bodywork, Easy Money was sprayed down with its signature color, Merlot Red, from PPG. The steel top was finished in Meteor Gray to flawlessly match the billet wheel centers. 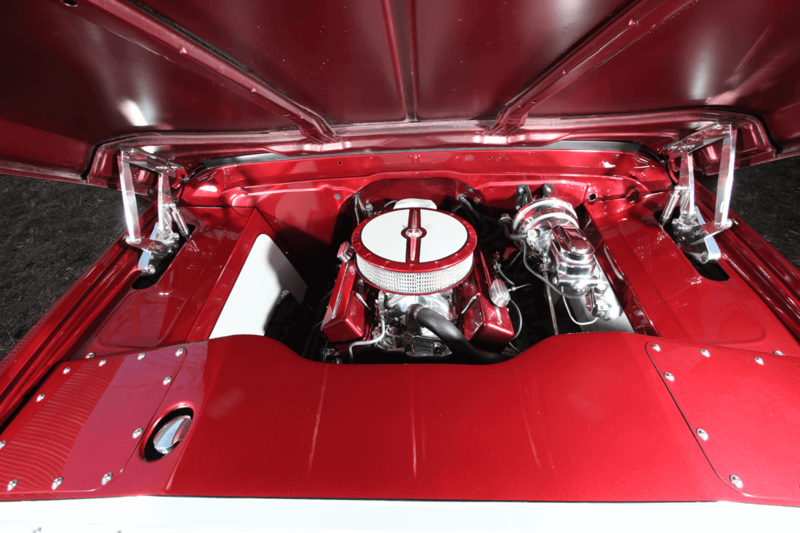 The custom engine bay components and motor accessories have been color-matched to the iconic paint scheme as well. One of the most striking and pleasing aspects of the Easy Money’s customizations is the subtlety with which they are done. Despite the top-shelf body and paint work, nothing is overstated or distracting. The truck makes use of the natural beauty and body that Chevy designed it with. This style is consistent in the interior. The subtle black and polished finish complements the exterior to a T. The door panels and rear interior quarter-panels were custom made by Pro Stitch. 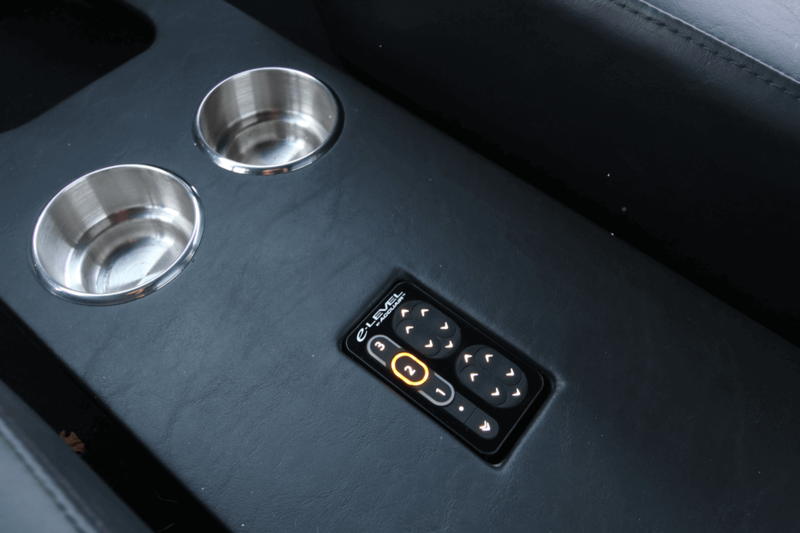 The Factory dash is enhanced with a custom center console, which houses billet cup holders and the e-Level controller. 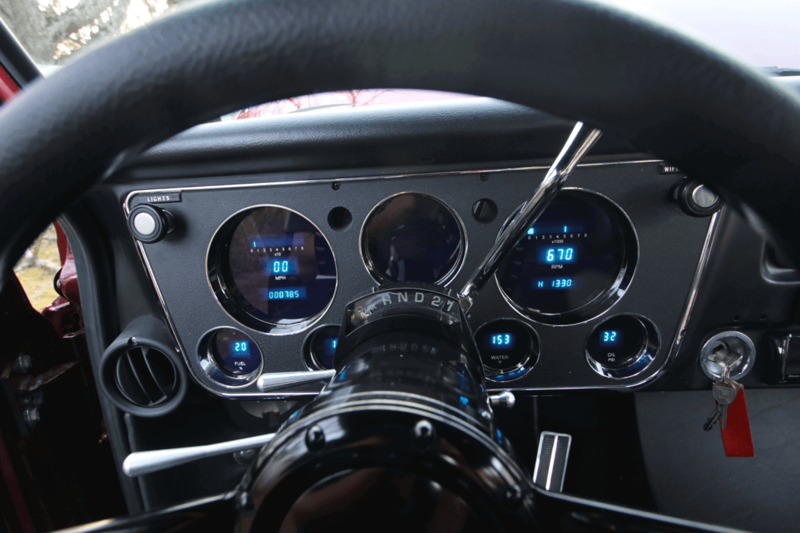 A Billet Specialties steering wheel hangs in front of a fully customized interface of Dakota Digital gauges. 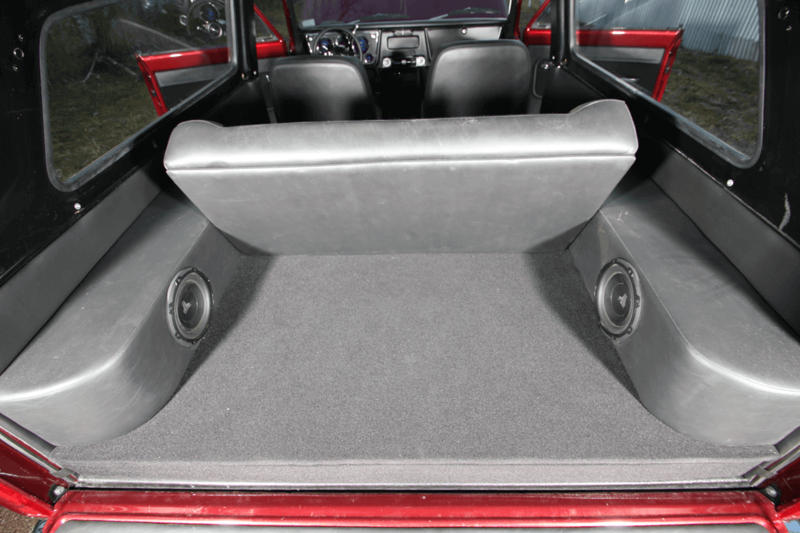 The rear sports a custom-built bench seat upholstered by Hudson Hot Rods & Customs. The front buckets seats have likewise been updated and reupholstered. The final touches to the interior come by way of billet window cranks and door handles from Clayton Machine Works. Housed in the dash and custom interior panels is a wicked cocktail of audio bits. The system was put together and installed by Traffic Jam Audio and features a Clarion head unit at the front of the operation. From there, sound waves travel through dual Kenwood amplifiers and are received via Diamond Audio midrange and tweeter speakers, and two 10-inch JL audio subwoofers.